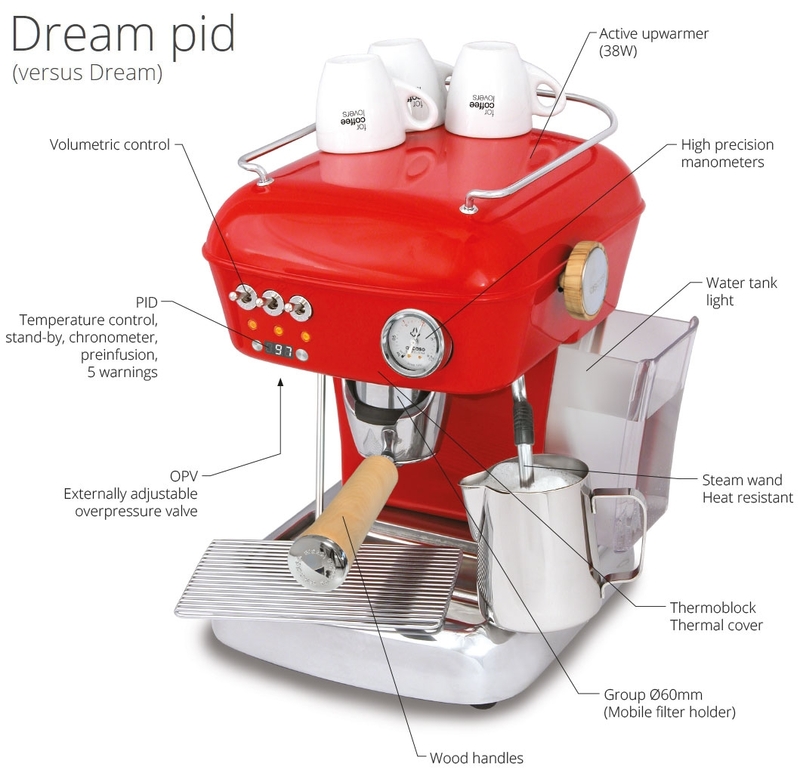 The recently upgrade Ascaso Dream Up PID version offers creative designs combined with impressive performance. European made with a 2 years warranty. The stainless steel lined thermoblock is designed for fast warm up times and its thickness provides for good temperature stability. The pump is controlled by a micro-processor which continuously pulses water from the water tank into the thermoblock heating system for unlimited steam. PID Display - Allows temperature to be adjusted in 1 degree increments and offers programmable pre-infusion between 0 and 5 seconds. Steam valve design utilizes compression valves with a rubber gasket that reduces the chance of lime scale buildup. 3 way solenoid valve, adjustable overpressure valve, and aluminum tamper. Active Cup Warmer - 38 Watt plate heats top of machine to keep cups stored on top hot. The Dream Up features a classic retro look that is combined with the best that modern technology has to offer. Part of the Ascaso"Versatile" line of espresso machines the Dream UP can use either ground coffee or proportioned single serving espresso pods. Simple to use controls - Center power switch to begin heating up the thermoblock boiler. Two professional grade rocker switches let you control the steam function (left) and the coffee brew control (right). 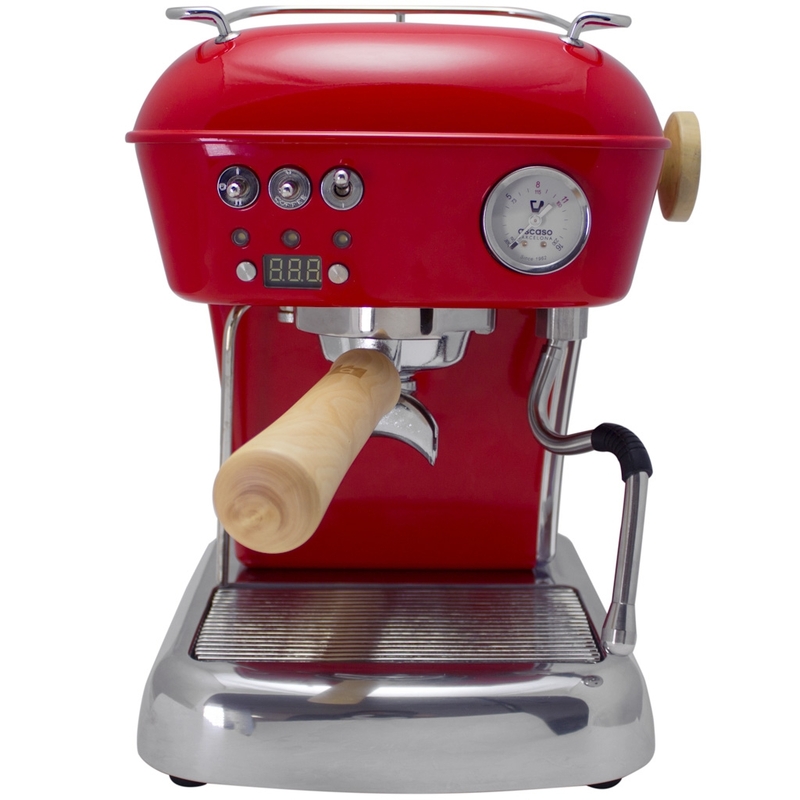 A series of indicator lights inform you when the machine is powered up, and when it is at the proper temperature for either brewing espresso or frothing milk. Temperature gauge - The Celsius temperature gauge monitors the temperature of the boiler in both coffee mode and steam mode. Frothing tip for perfect foam - The wand will make perfect foam. In an instant, the steam wand converts the milk in your 12 or 20 oz. frothing pitcher to lovely foam for lattes and cappuccinos. Mounted on a swivel joint, the stainless steel steam wand conveniently swings aside and clean up is a snap. 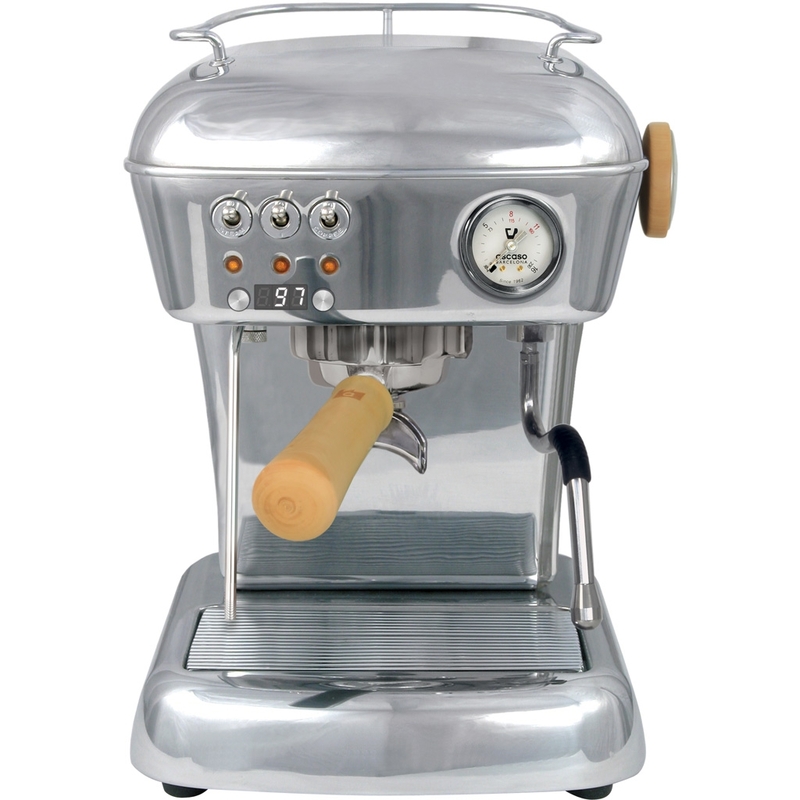 Quality brewing group - The Ascaso Dream espresso machine's group-head is made of chrome plated brass. Designed after Ascaso's commercial espresso machines, the Dream UP group-head evenly distributes heat and reduces hotspots for more temperature stability. Three way solenoid valve - As soon as the coffee switch is turned off, the three way solenoid valve relieves the pressure built up in the grouphead. This allows back-to-back espresso extractions without having to wait for the portafilter handle to lose pressure by itself. Heavy duty portafilters and filter baskets - Keeping with the tradition of using only commercial grade components, the Dream UP V3 uses heavy-duty chrome plated brass portafilters, which feature a rugged plastic handle. The same portafilter is used for ground coffee and espresso pods. Single shot and double shot 57 mm diameter stainless steel filter baskets are included for ground coffee, and there is a pod basket for single dose ESE pods. The double shot size baskets allow you to use more ground coffee per serving for stronger espresso or cups of coffee. 48 oz. water tank - The removable water reservoir, equipped with a water level indicator, can be top filled while operating or taken out and filled at your sink. The water reservoir is located in the lower section of the machine right behind the grouphead. Tank is illuminated making water level very easy to determine. 16 bar water pump - This powerful pump is key to a great espresso, more than enough power for the great espresso extraction of the Ascaso Dream espresso machine. Drip and cup tray, plus cup warmer - The Dream UP PID has a polished stainless steel drip pan and chrome plated steel cup try, both easy to remove and clean. A unique scratch resistant cup-warming surface on the top of the machine lets you keep your espresso cups warm so your freshly brewed espresso does not cool too quickly once it hits the cup. Stainless-lined thermoblock - With internal stainless steel lining heats quickly and is corrosion resistant. Construction with longevity in mind - The Dream UP PID body is constructed of corrosion resistant aluminum for extra long life. The aluminum is then finished in a chip resistant enamel paint. All components that make up the construction of the Ascaso Dream espresso machine are designed for long life and low maintenance. Included Accessories - Portafilter with 2 spouts, pressurized single and double filter baskets, single ESE pod basket, plastic tamper, scoop, instructional manual, cappuccino frothing attachment on machine, single hole steam tip, Ascaso cleaner, and ground coffee kit (which includes non-pressurized double cup filter basket, adapter, screw and dispersion screen). Please note that the only accessories included are the ones listed on this web page. Warranty - 2 year parts & labor. 1.3 liter water tank capacity. Power: 1000 watts, 120 volts. Dimensions: 9.6" W x 13.6" H x 11" D.